Unique Surround Sensor™ Technology delivers water only when needed, which results in water savings of up to 70% and helps prevent the spread of germs because of the touchfree technology. Utilizing Radius™ Technology, the 3" omni-directional sensing zone surrounding the entire spout guarantees accurate activation every time and sophisticated enough to compensate for users and the environment. 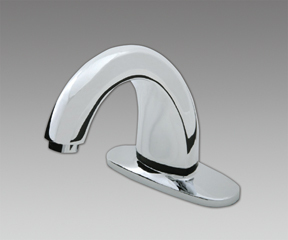 Units are easy to install and available in a variety of styles in polished chrome, polished brass or satin nickel. Contact your WAXIE Sanitary Maintenance Consultant for more information regarding this and other touch-free products available. This auto faucet sets the standard for reliability and user-friendly performance in automated faucet systems. Surround Sensor technology gives you easy, reliable upgrades and trouble-free operation. It's a sound, long term investment, reducing water use up to 70% and delivering positive user satisfaction and health benefits. Polished chrome, 4" center set, with a 1.5 GPM aerated flow rate. Four "D" cell alkaline batteries are included. UPC low lead listed.